It’s impossible to imagine Doctor Who without the Daleks. This is almost literally true, as the Daleks go right back to the very beginnings of the series. Look at the show’s early days: There’s the iconic introductory episode with the schoolteachers and the junkyard, followed by three episodes of the Doctor seriously considering throwing rocks at cavemen, and then the Daleks show up in the very next story, meaning that the introduction of the show’s most iconic monsters postdates that of their Time Lord adversary by only the slimmest of margins. Indeed, it was really the Daleks who were Doctor Who’s original breakout stars, as opposed to any occupant of the TARDIS; after all, the show’s initial wave of popularity was called “Dalekmania,” not “Doctormania.” But four decades of such familiarity can breed, if not exactly contempt, then a certain lack of respect. Their entirely inhuman appearance, so effectively chilling in their original adventures, became faintly risible when stripped of that narrative context. 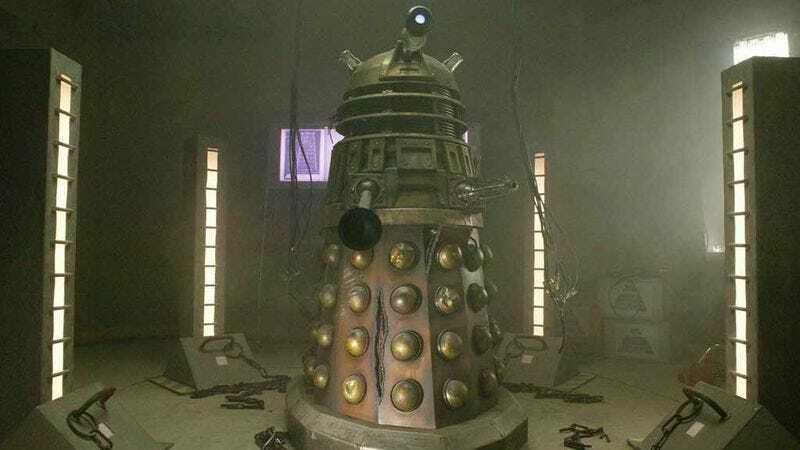 The fearsome, genocidal conquerors of the universe were transformed in the public imagination into plunger-wielding pepperpots who could be defeated by climbing the stairs—all of which are jokes that “Dalek” acknowledges and subverts with lethal force. The Daleks were also done in by their own popularity, appearing in six serials comprising a whopping 45 episodes in the show’s first four years, and they were only given a multi-year respite when the Doctor Who production team and Dalek creator Terry Nation agreed to retire the Daleks so that the latter could pursue a Dalek spin-off show. After the Daleks eventually returned in the ‘70s, the next major innovation was to introduce their creator Davros, whom the Doctor describes here as “a genius… a man who was king of his own little world.” The presence of this brilliant psychopath powered one of the all-time great Doctor Who stories, “Genesis Of The Daleks,” but his obligatory reappearances in subsequent Dalek stories tended to undermine his creations’ status as ruthless, terrifying strategists in their own right. As such, leaving aside the briefest of cameos in “The Five Doctors” and the 1996 TV movie, “Dalek” is the first time since 1974 that the show’s most iconic monsters appear without Davros alongside. I use the plural “monsters,” but there’s actually only one representative of the Daleks on hand here. As Rob Shearman’s script indelibly demonstrates, one Dalek is more than enough. The basic structure of this episode is remarkably simple, and it seems only fitting that the most iconic monster in Doctor Who history would return by chasing humans down what is essentially a very long corridor. The Americans in this story—particularly Henry van Statten’s elite paramilitary guard—function in much the same way as Arnold Schwarzenegger’s commando team in Predator; van Statten’s private army is the best money can buy and not shy about killing things, which makes the Dalek’s slaughter of them all the more impressive. That massacre isn’t defined by brute force either, as even though the Dalek appears indestructible enough that it could win a battle of attrition, it instead devises a brutally efficient way to exterminate the entire contingent. Joe Ahearne’s direction is so vital to the success of “Dalek.” He wrings every last ounce of tension and suspense from the chase and fight sequences, but it’s in the depiction of the Dalek that he really makes his mark. Daleks are so famous for their screams—and voice actor Nicholas Briggs gets plenty to shout about here—but Ahearne makes the Dalek most terrifying when it is silent. When it refuses to speak to van Statten, it becomes inert, betraying not the slightest hint of life. This stillness emphasizes not only the inhuman qualities of the Daleks but also its strategic mind; this Dalek, for all its murderous, xenophobic rage, is capable of waiting, which makes it eventual movement all the more terrifying. Shearman, Ahearne, Briggs, and Christopher Eccleston all commit to the idea that a single Dalek could easily kill the entire population of Salt Lake City if it is allowed to escape, and there’s little doubt of that by the end of the episode. But it isn’t just that this Dalek is an unstoppable killing machine; it isn’t even that the creature is a cunning tactician, deviously playing upon the human weaknesses of Rose and van Statten to get what it wants. Any half-decent monster is capable of such things on a good day. No, what’s really key to the success of “Dalek” is how the Doctor responds. This isn’t my absolute favorite of Christopher Eccleston’s performances as the Doctor—we’ll get to that in a couple of weeks—but this is probably his best work in the role, and “Dalek” is the episode that most depends on his ability to sell this Doctor’s battle-scarred trauma. Eccleston conveys every aspect of the Doctor’s survivor’s guilt, including the flicker of remorse he feels for committing genocide against the Daleks, for all their evil. His performance leaves no doubt of the long history that the Doctor shares with the Daleks, even if that might be new information to those watching the show for the first time. The Doctor’s response to the Dalek traces a clear arc; the moment the Doctor realizes he is locked in a room with a Dalek, he is utterly terrified, begging to be let out. Once the Dalek restores itself, the Doctor never underestimates what it is capable of, unlike the foolish humans—Rose included, albeit for different reasons than the rest. His knowledge of the Daleks of old forces him to consider extreme measures that would have seemed unthinkable just last week. Indeed, let’s compare “Dalek” with “World War Three.” In the earlier episode, the Doctor explicitly hesitates to blow up 10 Downing Street in order to stop the Slitheen’s plan to reduce Earth to radioactive rubble. The reason he gives is that he is unwilling to sacrifice Rose; while some of that uncertainty is the result of Jackie’s pointed questions about her daughter’s safety, it’s apparent that the Doctor personally can’t bear the thought of losing his newfound companion, and it’s only a direct order from Harriet Jones that resolves the situation. In today’s episode, that moral dilemma is distilled to a few terrible seconds, as van Statten tells the Doctor that he must seal the bulkhead doors, stranding Rose with the Dalek. 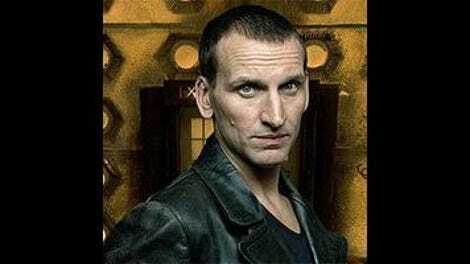 It’s a decision that instantly haunts the Doctor, and he lashes out at van Statten and Adam to assuage his own guilt. Still, in the moment, he doesn’t waver, even though this likely represents a mere delaying tactic against a foe such as this. The same Time Lord who wasn’t sure whether he could sacrifice Rose to save the planet from the Slitheen is now prepared to leave her to die just to buy some extra time against the Dalek. There’s no hypocrisy or contradiction here; this is simply the clearest proof that the Doctor is now operating under a very different set of rules, a code he hoped he had abandoned at the end of the Time War. It doesn’t help that he’s traded dependable allies like Jabe, Charles Dickens, and Harriet Jones for the likes of Henry van Statten. The character’s status as the owner of the internet is so specifically 2005 in its goofiness, but his larger-than-life persona proves a good fit for the Doctor and the Dalek. All that really matters about van Statten is that he’s the most powerful person the planet, able to replace presidents and wipe people’s memories at will, and even he cannot command so much as an insolent murmur from the Dalek. He, and by extension all humanity, is beneath the conflict unfolding between the Time Lord and the Dalek. Corey Johnson is very good in the role, finding just the right nuances in his interactions with the Doctor. The scene where they take turns playing the alien instrument is some of Shearman’s sharpest writing: van Statten is entirely capable of appreciating, even mastering such otherworldly beauty, but he just doesn’t care. He’s chasing profit, yes, but he’s really trying to stave off the boredom that comes with absolute power. He’s just unwilling to go on any adventure that requires him to surrender control, which makes him a rather pathetic reflection of both the Doctor and the Dalek. Longtime Doctor Who writer, script editor, and general elder statesman Terrance Dicks once laid down a defining description of just who the Doctor is, one that “The Day Of The Doctor” recently canonized: “Never cruel or cowardly.” Even if that maxim is only implicit in this episode, it’s still shocking to see the Doctor violate those fundamental precepts of his character. Cowardice is easier to excuse; indeed, only a lunatic wouldn’t be afraid if he found himself locked in a room with a Dalek. But the Doctor’s cruelty is more unsettling and more difficult to ignore. In their first scene together, the Doctor taunts the Dalek with the destruction of its entire species, defiantly takes credit for said genocide, mocks the Dalek’s distress call, and then actually tries to electrocute the Dalek while yelling “Exterminate!” The Doctor’s adoption of the iconic Dalek battle cry foreshadows the Dalek’s later point that the Doctor would make a good Dalek. One challenge for “Dalek” lies in the potential for radically divergent interpretations of the central conflict between new and longtime fans. Shearman’s script does not rely on past history in establishing what the Doctor and the Dalek mean to each other. This story would work just as well with an entirely new monster—as in fact almost happened, during a brief period in which the Terry Nation estate refused to give the show permission to use the Daleks—without changing a word of the script beyond “Dalek” and probably “Exterminate!” The possible discrepancy has to do with whether the Doctor is correct in his assessment of the Dalek. Anyone familiar with classic Doctor Who’s Dalek stories is unlikely to question the Doctor’s sudden absolutism. But those operating without such knowledge might agree with Rose, who refuses to give up on the Dalek’s capacity to renounce its ways. Her conduct here can seem gallingly foolish to anyone who has watched “The Dalek Invasion Of Earth” or “Remembrance Of The Daleks,” but Rose definitely hasn’t seen those stories, and, more to the point, neither had a sizable chunk of those watching in 2005. After all, Rose is simply putting into action the principles of inter-species interaction that the Doctor has taught her over the course of the preceding adventures. For those who have only ever shared these first five stories with the Doctor, it’s entirely conceivable that the Doctor is wrong about the Daleks, that he is allowing his own prejudice to get in the way of his normal ideals. As Rose pointedly observes during the climactic confrontation, only one individual is pointing a gun at her, and it isn’t the Dalek. This is a more audacious example of the same deconstruction seen in the TARDIS translation conversation back in “The End Of The World.” Shearman and Russell T. Davies set out to restore the Daleks’ reputation as Doctor Who’s scariest monsters while also asking the audience to at least consider whether Rose is onto something. This new Doctor Who isn’t merely about restoring the show’s former glory; it’s about pushing ahead with even the most deeply entrenched aspects of the mythos. Ultimately, “Dalek” rather niftily splits the difference between all these possible interpretations. Rose is right that this Dalek is capable of mercy and emotions that extend beyond hate. She’s just wrong in thinking that that’s a good thing. The Dalek’s absorption of Rose’s time traveler DNA takes what might have been a bit of goofy technobabble and uses it to drive towards the big climax, as a sympathetic, even apologetic Doctor tells the Dalek that it is mutating into something new. The Dalek is still Dalek enough to hate itself for such a violation of its sainted purity, and it would rather exterminate itself than face this strange, horrible new reality. It is a psychotic killer to the bitter end, if only because it would willingly self-destruct instead of facing the possibility that it is no longer a psychotic killer. It admits it is scared of the prospect of suicide, but that very fear is what makes its death unavoidable. The Daleks are still just as innately insane and evil as they have ever been, but “Dalek” demonstrates that not through some new brutality but rather through one Dalek’s utter revulsion at its own emerging goodness. Understanding the Dalek mindset remains as impossible as ever—thankfully—but this episode comes closer than any story before or since. It should be pointed out that so much of what this episode does to revitalize the Daleks as Doctor Who’s primary monsters was actually accomplished 17 years prior in the Sylvester McCoy serial “Remembrance Of The Daleks.” Currently ranked third on my all-time Who rankings, “Remembrance Of The Daleks” addresses the stairs question, presents the Daleks as cunning tacticians, emphasizes the Dalek obsession with genetic purity, keeps Davros’ presence to an absolute minimum, and tells a generally terrific story. It even features a broadly similar ending, as the Doctor confronts a Dalek with the possibility that it is the last of its kind in the universe, prompting it to self-destruct. Plus, the story introduces the Special Weapons Dalek, which remains the greatest three-word phrase in the English language. So then, why was “Dalek” necessary if “Remembrance Of The Daleks” had already proven that the Daleks were a force to be reckoned with once again? Unfortunately, that story aired as part of Doctor Who’s brief creative renaissance in the late ‘80s, a time when few were watching Doctor Who and even fewer were prepared to admit it. Another major influence on this story is Rob Shearman’s own Big Finish audio play “Jubilee,” which is officially acknowledged as the inspiration for this story. I have trouble calling “Dalek” an adaptation of “Jubilee” in all but the loosest of senses, as the original story as much defined by temporal paradoxes and altered timelines as it is a captive Dalek. Still, it’s a brilliant story on its own terms, and well worth seeking out as a companion piece for this story. Nicholas Briggs doesn’t always get his proper due for his acting in Doctor Who, and “Dalek” features one of his most complex performances; I think he might recently have outdone himself as the Ice Warrior in “Cold War,” but that’s the only major contender. As much as Christopher Eccleston deserves a ton of credit for emoting as much as he does when standing next to what essentially is, yes, a giant pepperpot, Briggs should also be recognized for matching the power of Eccleston’s performance. Briggs conveys the growing internal conflict of the Dalek without ever quite violating its essential monstrousness. This Week In Mythos: I feel like that’s what we just spent the last 2,000 words discussing, really. Yes, the Daleks are back, and they are confirmed as the Time Lords’ foes in the Time War, with the Doctor destroying both races in his attempt to end the conflict. The Vault is an early treasure trove of references to classic monsters, with a classic Cyberman head the star attraction of that part of the collection. Oh, hey, someone new joins the TARDIS in this episode. I’ve only mentioned Bruno Langley’s Adam once in this review, and I don’t really regret that, as he’s fairly inessential here. He’s not an entirely useless character, as Shearman uses his little speech about his genius to emphasize the callous hubris of those working in the Vault, but he doesn’t really offer anything that we haven’t already learned from van Statten. Still, there should be plenty to talk about with respect to Adam next week. There’s not too much more to say here, but I do think it’s interesting to consider about how the new Doctor Who might have progressed if “Dalek” really had represented a “final end”—to borrow a phrase from Patrick Troughton’s “Evil Of The Daleks”—for the show’s most iconic foes. Put like that, it really seems like there was never any chance the Daleks were gone for good, and I wouldn’t say the subsequent stories really undercut the impact of “Dalek” substantially. Well… maybe “Bad Wolf”/“Parting Of The Ways” does a bit, since the Daleks in that are also direct refugees of the Time War, but I think that story offers enough to compensate.